I didn’t expect it would be July before that happened. I did not see this one coming. Near the end of March, I was about to write a piece about how well the experience of sobriety was going with one of the most remarkable things being a nearly euphoric sense of well being. I had just finished a 30-day writing challenge and had gotten to spend five days on the Oregon coast. I was physically active and had my volunteer work going to keep me engaged. I felt great. And then, everything seemed to go south on me. Suddenly, I began to feel a sense of isolation and anger began to build up inside of me. I was plagued both by self-pity and a sense of inadequacy. I didn’t have friends to be with. I no longer had the comfort of a bar or a brewery to use to pass the time and enjoy the boozy camaraderie. I can’t explain the weird reversal of my my emotional state. There was not an easily identifiable trigger. I simply drifted into a state of withdrawal and anger bordering on a kind of rage–rage at the news, rage at nearly everyone I encountered on the road, simmering anger at every person in every bar or restaurant I entered who was allowed to enjoy their beers, when I had to deny myself. Was it their second or third? Why were they allowed to toy so casually with their health when I could not? I have been seeing a therapist who specializes in addiction medicine and I saw her twice during the month of May when things were going badly. Before the appointment begins, I have to take an iPad and click through a multiple-choice questionnaire about my mental state and how I’ve been doing since the last visit–have I been drinking, have I taken drugs, have I felt depressed, had I had thoughts of harming myself–you get the idea. I had not actually contemplated suicide over the past two months. I hadn’t started to imagine how I would do it or make a plan. It wasn’t like that. But I was feeling a deep sense of weariness, a feeling of being overwhelmed by the effort it took to say “no” to alcohol every day, and to simply cope with everyday life. Dealing with a minor car problem seemed epically difficult. The multitude of unfinished projects around the house made me feel surrounded by failure even though they were dwarfed by the overall beauty of our house and our yard. I hate to use a Hamlet reference (it’s so former-English-teacher-ish), but when he thinks about death he imagines the peace that comes from ending the “heart-ache and the thousand natural shocks/That flesh is heir to.” A respite from all of those “thousand shocks” was all that led me to momentary thoughts of being able to go to sleep and not get up to once again have to fight that feeling of being overwhelmed. It is as hard for me to describe clawing out of a depression as it is to explain how I fell into it, but two things stand out as I look back at how I began to heal. Since I retired, I’ve been a casual and occasional hiker around the county of San Diego even going so far as to join a hiking group that meets up once a week. I was far from passionate about it. However, inspired by my niece who has set a goal of 100 rigorous hikes during 2018, I started upping my interest as she and I began to meet up occasionally, and she introduced me to more and more challenging peaks to climb. As I started to get stronger, I started to push myself to take on these tougher hikes 2-3 times a week. The hikes became easier and my body began to recover more quickly between them. I found that the hikes literally cleared my mind as I was immersed in the natural terrain and the physical exertion I was putting in. But that kind of healing takes time and 6-8 hours a week of physical activity was not going to, by itself, be enough. 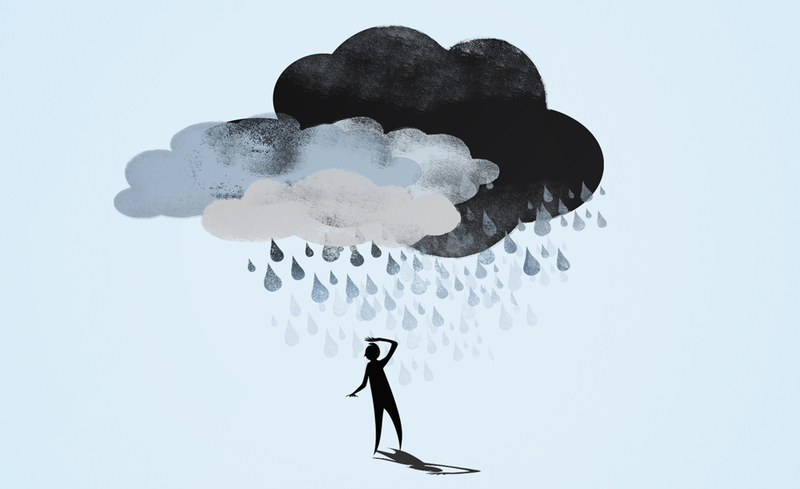 When I was still deeply mired in feeling bad, I sat on the edge of our bed with my wife and admitted the obvious–something that she clearly already knew–that I was really struggling with depression once again. She did the best of all things. She let me talk through my confusion, my anger, my sadness and just acknowledged and affirmed what I was feeling. When I was all talked out, she held me close and we just quit talking and I could feel something melt away inside of me. I can’t explain it. There was no advice, no insight–just warmth and love and reassurance. It was as if a boil had been lanced and the healing began almost immediately. Maybe that is what I was going through here. Maybe this was a time of growth and reassessment of my purpose and the things I need to work on to stay connected to the people in my life. I’m working on all of those things. I hope it will be enough to keep the storm clouds away.